Those lucky enough to have visited the Galapagos Islands will tell you it is a unique place. 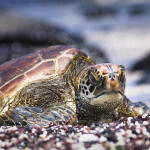 The new Discovering Galapagos chapter entitled “A Special Archipelago” teaches us what exactly makes the Galapagos Islands so unique. From their location, thousands of kilometres from the nearest land, to their mild climate and from their dramatic formation to their rich ecological history, no place is quite like Galapagos. It has been the combination of a particular set of factors that have made the Galapagos Islands the place they are today. Over 60 years ago, scientists first discovered one very unique environment of Galapagos. Home to some of the strangest animals and powered by hydrogen sulphide in the freezing, pitch black waters of the deep ocean, hydrothermal vents are one of the most hostile environments on Earth. Here bright red tube worms, giant clams and ghost white crabs cover the ocean floor creating a carpet of life in one of the most inhospitable places. 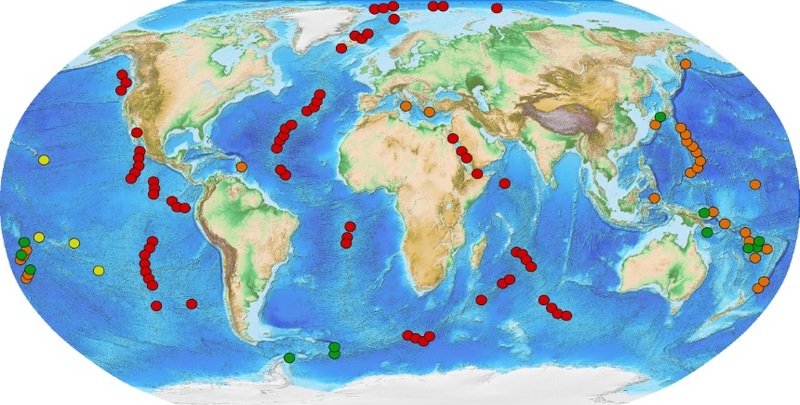 A map of hydrothermal vents around the world. Hydrothermal vents occur where cracks in the sea floor allow water to drain through the ocean’s crust where it is heated by magma chambers. The scalding water, which can reach temperatures of up to 400°c, travels through rocks, dissolving a cocktail of metals and salts. This super heated water bursts back through the sea floor as hydrothermal vents. It is one gas in particular, rising from these vents gives, this ecosystem life. Sulphur dioxide is toxic to most life on land however bacteria living in the vents use this gas as a source of energy and providing life to the rest of the food chain. In fact, it is these bacteria which are thought to be the oldest forms of life on Earth. Today, scientists have discovered hundreds of hydrothermal vents around the world however they were only first discovered in 1977 by a team working off the coast of Galapagos. The discovery revolutionised scientific thinking on how and where life could exist. The exploration of the hydrothermal vents along the Galapagos Ridge has lead to dozens of new and intriguing creatures being described. Scientists today are still exploring deep sea vents, trying to answer the many unanswered questions around these unique ecosystems. Questions such as how long do hydrothermal vents last, how do ecosystems change and adapt to life in these extreme conditions and are vents, such as these, really the origins of life on Earth? In our next blog we will explore the oceans around the Galapagos and how they have become one of the most productive ecosystems. Categories: A Special Archipelago | Tags: discoveries, hydrothermal vents.